I came home from the hospital in a stocking! I was born on Dec. 22nd and went home three days later. I still have my stocking and used it every Christmas growing up. 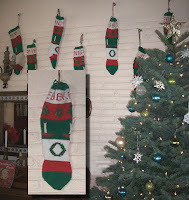 After we got married, my husband complained that his stocking was WAY smaller than mine. I didn't do anything about it until I was pregnant with our second child, at which time I cut up two of my Christmas dresses and, using my stocking as a pattern, made unique stockings for all three of "my boys." That's sweet that your folks got a Christmas baby. We have a Thanksgiving baby and a Groundhog Day baby, but that's about it. Susan, you got nuttin' as in no story to share, or nuttin' for Christmas? This year, because we're in the US and aren't normally, my mom is scrambling to find stockings for our family. Wisely, she's checking thrift stores first. We have, so far, declined changing any of our kids' names to match a cute stocking. Mideastmom, I commend you for sticking to the original names you chose, though for a price, it might be tempting! (Off-topic: I wish you had never mentioned the existence of Blue Bell Snickerdoodle ice cream. I may crave it until I hit Texas someday.) Enjoy your Christmas in the USA this year. Peggy just showed me this blog. Our families seem to have the same tradition. We do the exact same stockings, and I am just beginning to knit them so I can take over when my grandma can't do it anymore. I'll have to see if I can show you when I see you next. That's great, Hannah. Considering I don't even know what "purl" means (assuming it's a knitting term? ), you may not realize what you are offering. I am a complete novice. That's crazy that the other L family has the same tradition. As kids we would anxiously wake up Christmas morning and see what was in our stockings. The rest of the gifts had to wait for mom and dad to wake up but the stockings were good for any time! We were always given a box of special cereal which would last throughout much of the Christmas break. The only time of year when we got that sugary cereal that's so healthy for you! As we got older, we begin all filling each others' stockings but Mom always had a special cereal box sitting under the stocking. Cereal. That's a fun tradition. My own daughter is now in charge of stocking stuffers since she lives stateside and can get things not available down here. Her luggage is going to be HEAVY when she comes down. We make the kids wait to open stockings until we're all up and ready.